My Swedish grandmother was a great cook. One thing she always served was vetebröd, which our family always called bulle. Vetebröd is a traditional sweet Swedish sweet yeast bread that is often flavored with a very unique ingredient – cardamom. Every time I smell this cardamom bread I think of my grandma. This is definitely one of my strongest “memory foods.” Bulle means “bun” and my grandmother generally made buns, but my mom and I like to do the braided loaf version of this bread at the holidays. So, on to the recipe! I took some step-by-step photos for you, shown below. Swedish sweet breads like vetebröd can be baked in many different shapes. The recipe I have calls for simple buns, but braiding the bread is how my mom and I like to bake it. Because I love you all soooo much, I decided to share our family’s special way of braiding the loaf. It’s a great little trick. Add remaining sugar, cooled melted butter and salt. If using cardamom pods, break open pods and remove the tiny seeds, then crush the seeds thoroughly. Add cardamom (the freshly-ground stuff or the 3 teaspoons ground cardamom) and 4½ C flour to yeast mixture. Place remaining ½ C flour on board or pastry cloth for kneading. Turn out dough and knead until smooth and elastic. Note: I put all 5 cups of flour in step 2 and then let my Kitchen-Aid do the kneading with the dough hook attachment. Place kneaded dough in greased bowl. Cover with cloth and let rise until double in bulk, ¾ - 1 hour. Cut into even size pieces and roll into balls. Place on un-greased cookie sheet. Brush with egg and sprinkle with ¼ c sugar (Swedish pearl sugar is the best) and almonds (if using). Let rise until double in bulk, 30-40 mins. Bake in moderately hot oven, 400ºF for 12-15 minutes. If you want to make the braided loaf, keep reading the directions below. When cooking it as a loaf, bake the bread at 350º F for 20-30 minutes, until the top of the bread is very browned. 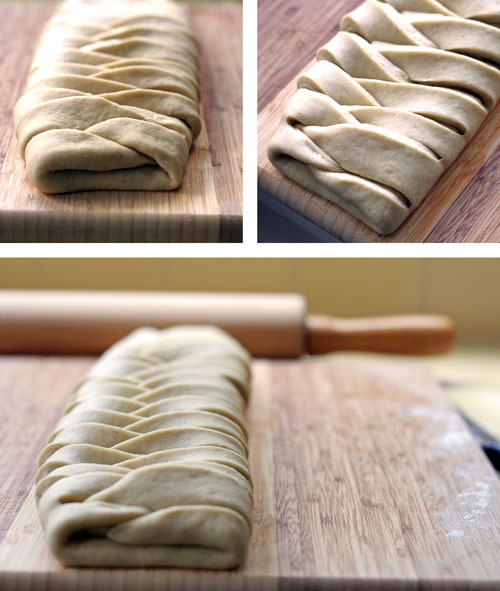 Once the dough is ready to cut into pieces in step 4, you can instead roll out the dough to make a braid. This recipe will make four 12" braided loaves. Divide the dough into fours and form into a round, even ball. Smoosh the ball down into a rectangular-type shape (as best you can). 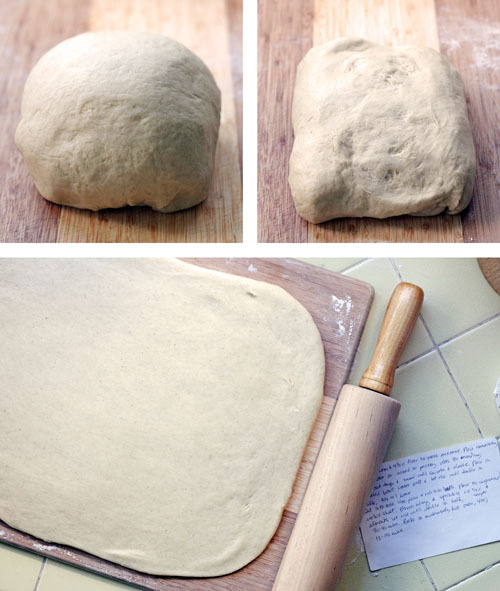 Roll out to a large rectangle 12" long and as wide as you can get it, rolling the dough pretty thin (maybe ¼" or so). The thinner the dough at this stage the more evenly the bread will cook. Score two lines to divide the rectangle into thirds (the lines should be 12", the length of the loaf...does that make sense? See photos above). These score lines are guides and should not be very deep. Cut lines perpendicular to your score lines starting at the score line cutting out to the edge (see pictures). Make cuts appx. 1 inch apart. The cuts should be made down both sides, should line up and be even in number. (Am I making sense? Thank goodness for pictures!). 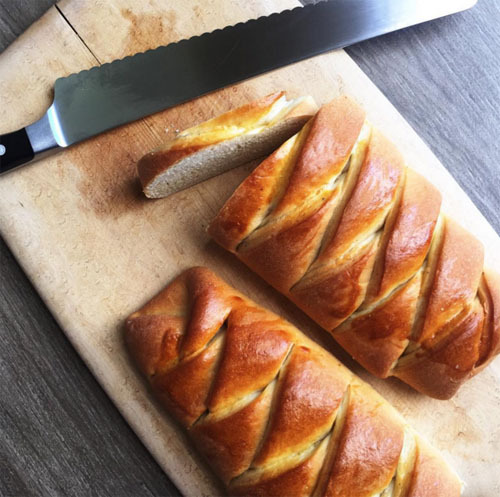 When I used to make this, I would just divide the dough in two and make two braids (what you see in the pictures) - but that made for a thicker braid and the outside would cook before the inside. I have since started dividing it into four braids, which is easier to roll out thin and cooks more evenly. Follow instructions in Step 4 above for prepping to bake (including rising again). 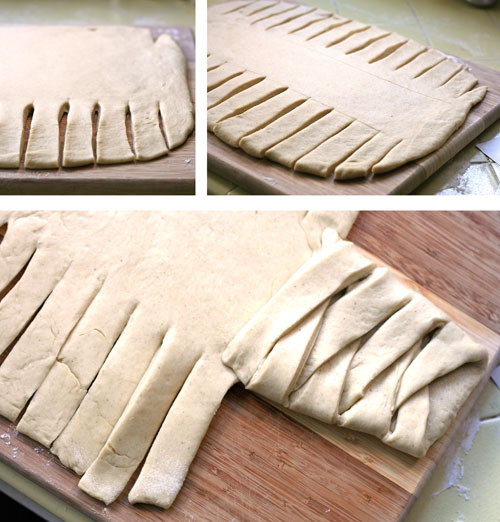 You can cook two braids per cookie sheet - the sheets are 12" wide, so the braid fits cross-wise. If you do have thicker braids that seem to be cooking too quickly on the outside, about halfway through the total bake time cover the loaf with foil. This keeps the outside from getting to dark and it cooks beautifully. 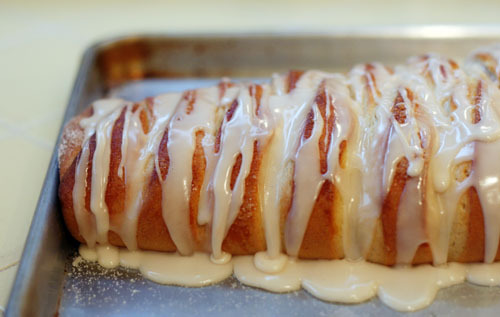 It’s traditional to bake the bread topped with pearl sugar and/or almonds, but our family likes to make a vanilla glaze to drizzle over the top. Put powdered sugar in a mixing bowl. Add vanilla/almond extract and salt, then pour in a bit of the milk (or cream or half-and-half), probably 2 teaspoons or so, just a quick swig. Whisk well. A little bit of fluid goes a long way, but add more one teaspoon at a time if needed to get the frosting to a drizzling consistency. I double this recipe to cover four 12″ loaves. I’m not sharing this recipe because it’s an easy one. I’m sharing it because I love it and is special to me. It takes some time, but it is not difficult and so delicious. Eating this soft, yummy bread straight out of the oven is the best. But to replicate the effect the following day, I just zap my bulle in the microwave for 10-15 seconds…mmmmmmmmmm…. Click here to see how I make this bread into buns, which is another delicious way to enjoy them! 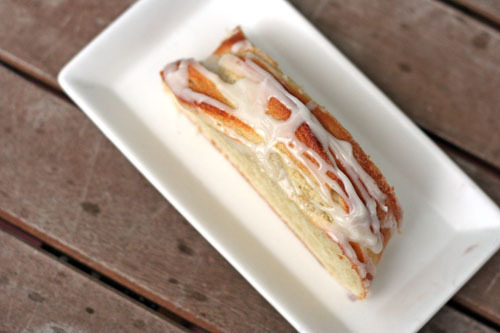 This link and this link will will take you to recipes for Swedish cinnamon buns (a little different than this recipe, but I’m sure still tasty). 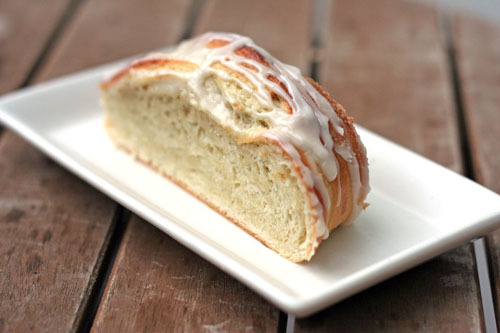 Both of these recipes illustrate how to make the dough into pretty buns. 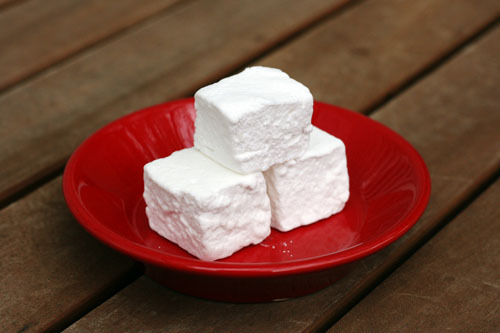 This is a great way to cook vetebröd, my grandma usually made these types of buns. Also, after visiting Sweden in 2018, my mom, sister-in-law and I figured out a new way to make cardamom buns. Click here to see the recipe and instructions. 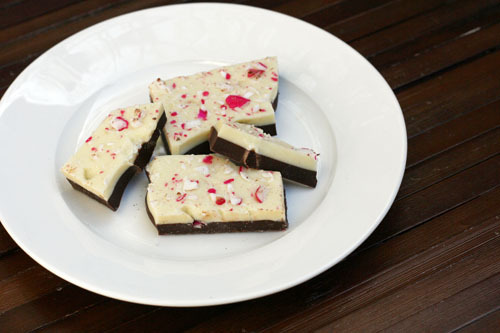 Why does this peppermint bark from Trader Joe’s have to be so good? Darn you, Santa, for tempting me with such delicious stocking stuffers. I can’t tell you how happy I am it’s Christmas Eve! I have been doing some cooking the last few days, but as a Christmas gift to myself I’m taking it easy this week and will post more regularly starting again Sunday. Rest assured, wonderful food will reappear on the blog next week! 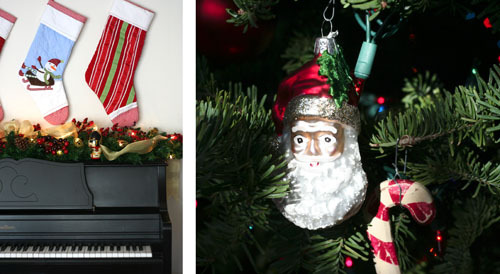 Until then, our stockings are hung by the piano with care and our little family is waiting anxiously to celebrate this most wonderful of holidays. Happy Christmas and Seasons Greetings to each and every one of you! A delectable delight here in the Bay Area is Fred’s Steak. 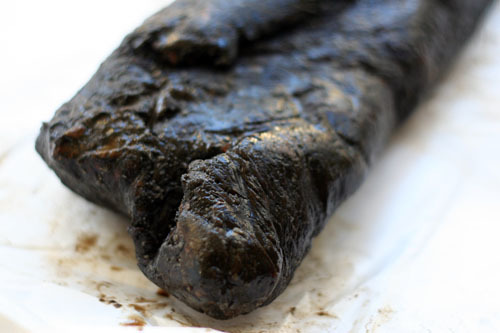 This is what Fred’s Steak looks like after it’s cooked. It melts like butter in your mouth and the flavor is unreal. Here’s what it looks like uncooked. Pretty nuts, eh? It’s kind of shocking when you walk into the butcher shop to see a big pile of BLACK meat. 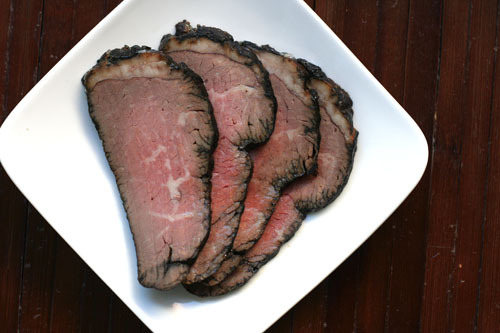 I think this might be my favorite red meat to eat. Although, filet mignon at a fancy steakhouse like Donovan’s might take that top spot. Regardless, I love Fred’s Steak. Too bad it’s $14 per pound! While it is in fact worth every last penny, my wallet can only handle Fred’s Steak for a special treat. 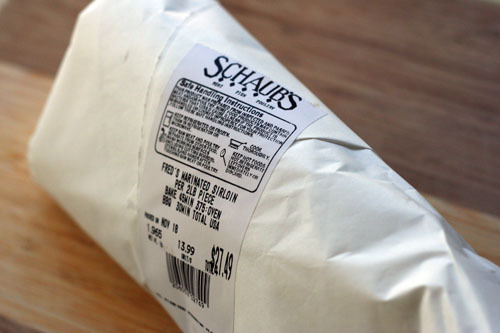 When I bought our cut at Shaub’s (the originator of Fred’s steak; you can also get it at Draeger’s), the butcher told me that while cooking it on the grill gives it a nice crispy exterior, most of the butchers like simply cooking it in the oven. So that’s what I did. It was so easy and came out perfectly. For those of you who live locally, this would be a great meal for Christmas. Maybe Santa can cover the cost. It’s official, this post has made me hungry. For those of you who don’t live anywhere near Schaub’s or Draeger’s, there is a recipe for the marinade on the Fred’s Steak Wikipedia page that may be worth trying! 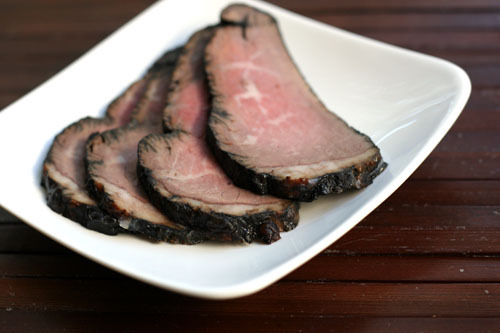 I would marinate a piece of sirloin for 3-5 days in a ziploc bag and then cook in an oven at 375 for around 45 minutes. I might just have to try it myself. Boring menu post this week. No picture. No cute stories. Just a bunch of sick people in the Maynard house. But that’s not going to stop me from getting a menu up on Sunday! Here goes…and here’s hoping we’re all pictures of health by Christmas Eve. – Annual chili party at a friend’s home…if we’re not sick, that is! If we’re sick, I think I’ll just make chili anyways! Those of you who have been reading this blog for a while may remember my annual stresses over birthday cakes. Last year I begged you all for birthday cake tips, and then I chickened out and made a layer cake that was cute and tasty, but not very adventurous. Our little Anna likes Spiderman a lot. It’s pretty cute. 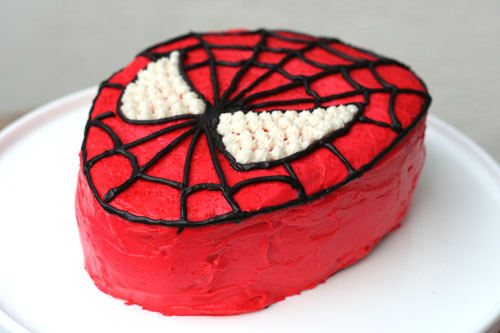 I decided that I would make her a Spiderman cake this year. 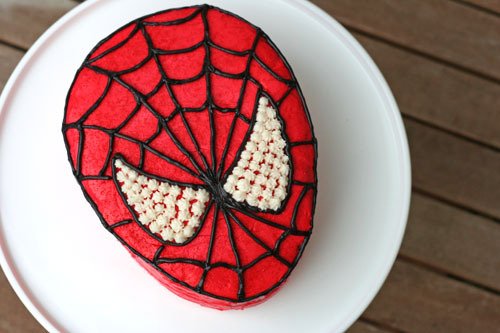 Thankfully his head is a simple oval, so this was a good cake for me to get my feet wet with. Do you mind if I brag a bit? I love her cake! I’m so happy with how it came out. YEA!!!!! I will say this. I didn’t cheat at all in the process. I used cake strips, of course. I froze the cakes before assembling and frosting. I made the frosting from scratch, so I could make a ton for not much money and have plenty to work with. I used wax paper to keep the cake platter clean. I applied a crumb coat of frosting first before doing a top layer of frosting. I used tons of food coloring to get the color of icing I wanted. 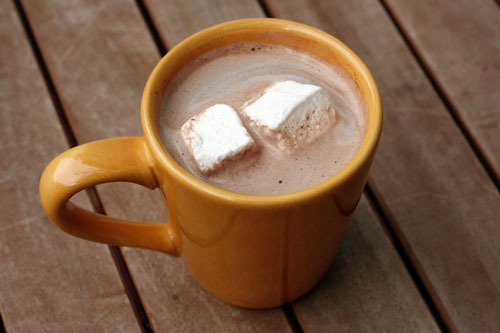 Didn’t those marshmallows in yesterday’s hot chocolate look really yummmmmmy? Well, they ARE. And if you want them, be sure to read my post on Make & Takes today! This year I decided our neighbor & teacher holiday gift would be homemade vanilla hot chocolate. I figured it would be easier than making and decorating oodles of cookies. I was wrong. Well, only because I QUADRUPLED the recipe. And ended up having to grind about 10 pounds of chocolate. With a Cuisiniart mini-prep. Yeah, it was a feat. BUT…the vanilla hot chocolate is delicious! And a fun, unique gift to give friends for the holidays! You’ll find the recipe at the bottom of this post. A few quick notes. I have a Cuisinart mini-prep, which is what I used to grind the chocolate. It works fine…but if you DO have a bigger food processor, use it! This is the recipe I used the vanilla beans for. I saved the sugar-coated bean pods after I was done making the vanilla sugar…I figure I can use them in other recipes, even though the seeds are gone. If you plan on making TONS and TONS and TONS like I did…you’re going to need BIG bowls. I ended up having to use three giant bowls and mixing all the ingredients between the three bowls, trying to evenly distribute the ingredients by mixing and remixing the contents of each bowl. Here was the final product. Aren’t they cute? I used some free gift tag templates from HP with matching ribbon. Place sugar in large bowl. Split half vanilla bean lengthwise, scrape seeds into sugar, and add pod. Work seeds in with your fingers. Cover snugly with plastic wrap and let stand overnight at room temperature. In food processor fitted with metal blade, process semisweet chocolate and milk chocolate until finely ground. Remove pod from sugar. 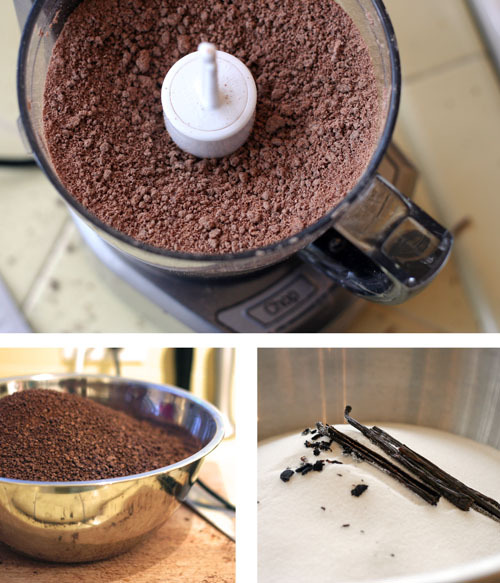 Add ground chocolate and cocoa powder to sugar and whisk to blend. Store mix airtight at room temperature for up to six months. To serve, Jane’s instructions: I heat 2 cups of milk over the stove and whisk in about ⅓ cup of the mix. You can also heat the milk in the microwave and it works”¦but the stove is a little better. If you like it richer, add more mix! 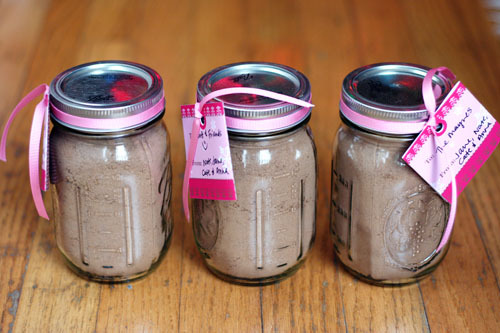 Jane Note: I used 16 oz mason jars and was able to put ~1¾ cups of mix in each jar. When I quadrupled the recipe, I filled 19 jars, plus a little left over. ”¢Save the other half of the vanilla bean for another use, such as a second batch of vanilla sugar, which keeps indefinitely and can be used in baking, coffee, or simply to sprinkle on fruit or waffles. ”¢Dutch process cocoa has been treated with an alkaline solution, which gives it a darker color and less bitter flavor and makes it dissolve more easily. For the rest of you…there is still time for holiday shopping at RedEnvelope. And don’t forget, if you click on any of the RedEnvelope links in this post, you’ll get 15% off your order! Happy shopping! 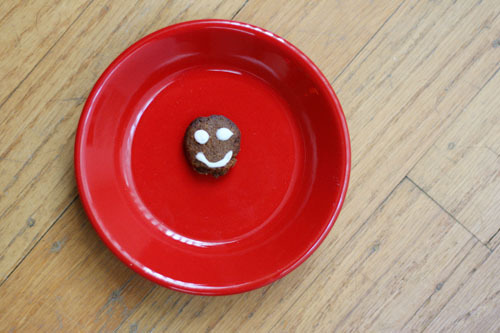 At first glance, this gingerbread head may seem a tiny bit on the morbid side. But it’s actually cute. Cate received a gingerbread man cookie from a friend at school. She couldn’t wait to get home to eat it. After a few minutes of munching, she brought the head to me and told me she didn’t want to eat it. When I asked why, she simply replied, “I like him.” Apparently she didn’t like him enough to save his body, but I still thought it was pretty sweet. Now begins the craziest two weeks of my year…both of my daughters’ birthdays are this week (only one day apart! ), which just so happens to coincide with the already busiest time of year. Needless to say, we have a lot going on. I need to try to keep it VERY simple and realistic. Wish me luck. Can’t wait to see what you are having for dinner this week. Remember, I don’t care how fancy or UN-fancy your menus is, I like to see all of them! And Happy Hanukkah to all of our Jewish friends! 🙂 Cate has been educating us about Hanukkah a lot lately, including singing “O Hanukkah, O Hanukkah, Come Light the Menorah” while Christmas tree shopping and making a star of David Christmas tree ornament at a church Christmas party. We’ve loved every minute of it!